When San Diego-based mixologist Shelby Atkinson of the stylish Sycamore Den was looking for inspiration for the winter cocktail menu, she turned to her home kitchen. “I cook a lot, so I was inspired by seasonal flavors I use in my kitchen this time of year,” says Atkinson. “Root vegetables like carrots and warm spices such as turmeric and ginger came to mind instantly.” The result: the vibrant, surprisingly healthy Forbidden Root cocktail. The drink gets its edge from a pairing of two clear spirits: vodka and aquavit, a spiced Nordic spirit that adds subtle notes of caraway and star anise. 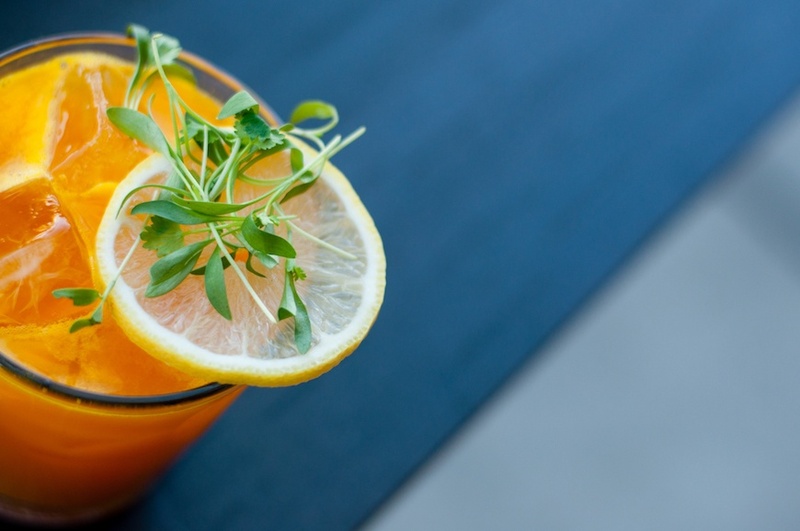 The bright color comes from turmeric juice, which adds more than an anti-inflammatory punch: The early flavor is making it a bartender favorite in cocktails around the country and the orange hue and subtle sweetness come from fresh carrot juice. Overall the drink has a slightly savory flavor that makes it unique and helps imbibers avoid the dreaded post-cocktail sugar crash. Keep reading to learn how to make this turmeric-carrot cocktail at home. 1. In a cocktail shaker filled with ice, combine aquavit, vodka, carrot juice, ginger syrup, turmeric, and simple syrup. Shake until chilled, pour into a cocktail glass filled with ice. Garnish with a slice of fresh lemon and cilantro. If you want more ways to get a turmeric fix at happy hour, try this ACV, bourbon and turmeric tipple alongside this turmeric-spiced popcorn.